Former Ladbrokes boss and renowned Aussie bookmaker Dean Shannon has embarked on his next chapter by launching Australia’s newest online betting agency, Neds! The site went live in early October, just in time for the the massive upcoming Spring Carnival and already offers an extensive range of markets. See our full review of Neds below. 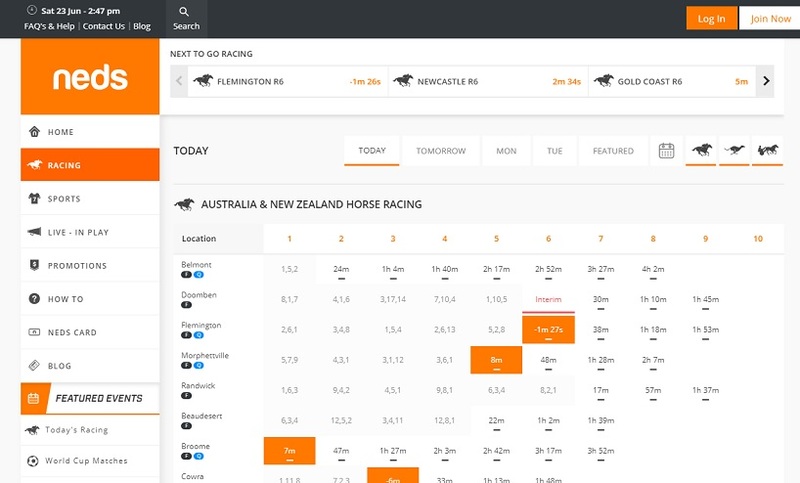 After being the inspiration behind Bookmaker.com.au, which was later acquired by Ladbrokes, Shannon’s experience in starting a new agency has really delivered here and it’s obvious when you first arrive at the sight that it is no usual start up. The expert team at Neds have developed a site that is really smooth and easy to use and offers all the things you’d want out of an online betting agency, something that is rare for a site in it’s infancy. The website features the standard three-panel setup that is seen in most online agencies these days, with the sport and racing menu on the left, the markets in the middle and the bet slip on the right. Neds has nice, clear and easy to see menu options that will quickly point you in the right direction. Maybe the most impressive thing about Neds given that they are so new is the extensive range of markets they offer. At first glance, Neds appears to be able to compete with some of the major online agencies in Australia already. At the moment you can find markets for AFL, NRL, NFL, MLB, NBA, Soccer, Golf, Cricket and of course Racing. They even offer markets on some of the more unique sports that some agencies avoid like E-Sports, Darts and Snooker. Neds offer a great range of deposit and withdraw options including instant methods such as Credit Card, PayPal, Poli and 1-3 day methods like Bank Transfer or BPAY. They also offer a Neds Card, which is a special credit card that can be used in sync with your betting account funds to quickly withdraw money from your account on the go. Neds offer a live chat feature that is quickly accessible from any page you might be on throughout the website by clicking on the little message icon in the bottom right corner. It’s a great feature that has started to pop up in a lot of different agencies and allows punters to quickly get in touch with someone for support. If you sign-up to Neds through Before You Bet you will be able to scoop an enhanced 100% matched bet bonus up to $500! To claim the full Neds bonus, punters must make a first deposit of up to $500 and then that amount will be 100% in bonus bets. If the first deposit is less than $500, then Australian sports bettors will still simply receive 100% of their first deposit amount. So this offer is great for all punters, regardless of how much you want to bet!